According to the 2013 National Coffee Drinking Trends report, American coffee consumption is up 5%, with 83% of adults drinking coffee. While drinking one or two cups of brewed coffee can be beneficial for your health, drinking more than that can lead to some health issues, like weight gain. The problem is, many people do not just drink plain brewed coffee; they tend to favor blended drinks loaded with sugar, cream, and syrups. This article will focus on potential weight gain from coffee. Keep reading to learn more. The average cup of brewed coffee contains around 2 calories. The average blended drink (with cream and sugar) can contain anywhere between 50 and 100 calories. 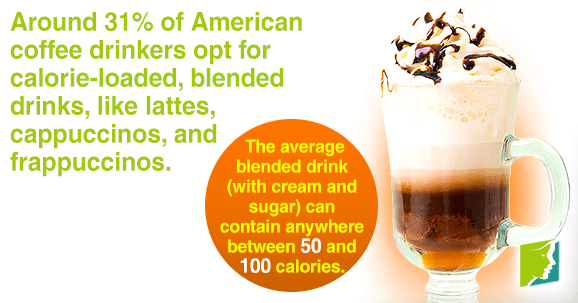 Around 31% of American coffee drinkers opt for calorie-loaded, blended drinks. These “gourmet drinks” include lattes, cappuccinos, and frappuccinos. They typically contain whipped cream, sugary artificial flavoring, syrups, and extra sugar. It is important to try and steer clear of these drinks in order to prevent weight gain, as healthier choices are available. An Australian study published in the Journal of Agricultural and Food and Chemistry reported that drinking around five cups of coffee per day can cause weight gain. This is because it can worsen metabolic syndrome, which contributes to stored fat in the stomach and waist. Polyphenols contained in coffee can contribute to this type of weight gain. Additionally, caffeine increases the stress hormone, cortisol, which increases cravings for sugary, salty, and fatty foods. These foods, of course, tend to make you gain weight. Certain popular gourmet coffee drinks have a surprising amount of sugar and fat, and most of their calories are empty. Keep these approximations in mind next time you are at the café. Experts say that drinking one to two cups of regular brewed coffee every day can actually be beneficial to your health. Keep in mind that means either black coffee, or coffee with non-fat milk and little or no sugar. Drinking any more than this could lead to weight gain. In addition to this, it is crucial to maintain a healthy and active lifestyle, as well as a balanced diet for healthy weight. Mubarak, A. et al. (2013). Supplementation of a High-Fat Diet with Chlorogenic Acid Is Associated with Insulin Resistance and Hepatic Lipid Accumulation in Mice. Journal of Agricultural and Food Chemistry, 61(18), 4371-4378.